The Canadian Federation of Independent Business, which produces the index, blamed the commodity bust but added additional sectors, particularly those that are considered absolutely crucial for the hopefully coming economic recovery in the second half: construction, transportation, and retail. And that feverishly expected rebound of GDP in the second half from recessionary levels in the first half? Small business owners don’t see it. What they see is a continued downturn. 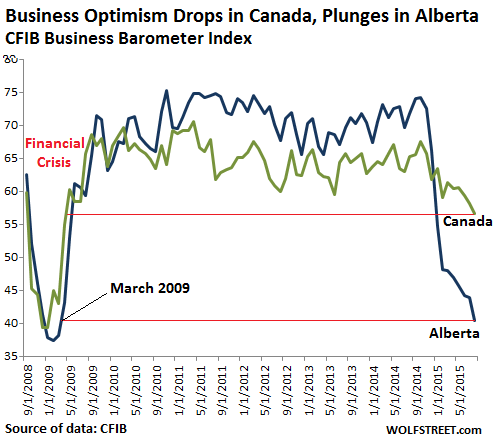 But it’s in Alberta where small business optimism has totally crashed. The Index dropped 3.5 points in August to 40.4, the worst level since March 2009, and just one such step above the historic low of 37, of February 2009, the very bottom of the Financial Crisis. A bitter irony: for the years after the Financial Crisis, small businesses in Alberta were practically exuberant compared to those in the rest of Canada. But in November and December, their exuberance dissipated into the oil bust, and the index began plunging. In January, it fell below the national level for the first time since March 2010. And it has continued plunging. “As businesses are crunched, they’re examining all of their expenses more closely – their taxes, the regulatory costs, their wage costs – and if the government continues to add to the list of things, at some point they simply can’t handle all of those new costs,” CFIB Alberta director Amber Ruddy told the Calgary Herald, with an eye on the province’s new government that is musing about raising royalty rates on energy companies at the worst possible time. And it’s not just businesses. It’s consumers too. Confidence of Canadian households regarding current economic conditions, according to the Conference Board of Canada, dropped to 91.9. Last year, the index was set at 100. 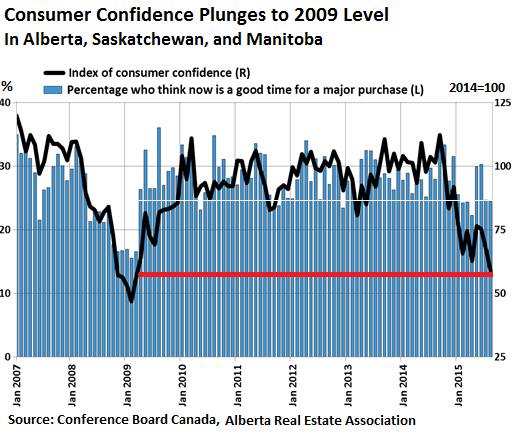 But in the Prairie Provinces of Alberta, Saskatchewan, and Manitoba, consumer confidence plummeted to the lowest level since March 2009. It looked dreary in the Prairie Provinces: Expectations for household budgets declined in August, and more households expected their budgets to decline further over the next six months. The outlook for jobs deteriorated, as layoffs of employees and reduced hours or no hours for contract workers – numerous in the oil business – are cascading through the local economy. So it remains a mystery where exactly the power for that feverishly anticipated rebound in the second half is supposed to come from, unless a miracle happens to commodity prices. But miracles have become exceedingly rare these days. ← Why Are the Four Richest Men in Mexico Getting Crushed? So we should buy Canadian dollars? You make your own decisions as to what you want to buy. rjohnson, don’t worry we’re going to have a socialist/marxist government after the Oct. 19th fed election (and I don’t mean marxist in the sense of the former Marx Bros. comedy troop, although you never know what they’ll end up becoming). They’ll fix everything, they have all the answers right now. Oh, and to answer your question, “should buy Canadian dollars,” wait until after the election when the C$ falls down to U$0.55. Read up on what Vijai Mohan has been saying about the Cdn economy. You seem not to have a problem with corporate socialism and welfare. Finland is socialist and every person there is a millionaire in their pension. They have strict labor and environmental regulations as well. It’s a shame that the psychology says that the people should be robbed of their wealth instead of being the main beneficiary! You seem to not have a problem with Public Servant Socialism and welfare. Gotta keep those ” golden parachutes ” going huh. ” every person is a millionaire in their pension. Hardly !! good try though. It’s a shame when the Gov’t robs independent business owners of their wealth so they can pay themselves high salaries and golden parachutes. Socialism doesn’t work, never has, never will. Robert, I’m not sure why you think I’m advocating “corporate socialism and welfare”–I’m not. We pay horrendous taxes in this country called Canada and get much more waste and outright theft of the treasury at all levels of governments (federal, provincial, municipal). It’s been just announced in the last few days that we dumb canucks are paying more in taxes than we are for food, shelter and clothing combined! At least those of us dumb enough to work in the private sector, that is. There are very many wealthy retired public servants scooting around in expensive Mercedes, Range Rovers, BMWs, etc. How do I know that you ask? I’m very nosy–I ask them at gas stations what they do or did to make that toy theirs after a little bit of flatery. You need to wake up. The money I pay into my pension and my employer even makes a larger contribution is not saved or set aside for my retirement. In stead it is spent immediately and the Canadian government then relies upon future generations to make good on the governments promise of a pension. This is socialism, but it is funded by me and my employers through the years. The government is nothing but the trustee who leaves IOU’s in my pension account. This is the way that Capitalism has gone! No rich person or big corporation has to return 50% of their gross revenue to the government! Perhaps it is time that they did! Exploit the poor and give it to the rich is what we have gotten! Customers world-wide are revealed to be flat broke, they cannot borrow and those that can refuse to do so. A class war is brewing, the ultimate weapon of the customer vs. Big Business is simple thrift. The rich borrow their fortunes, when customers refuse- or are unable to repay their masters’ debts there is no one else. The creditor looks then to the borrower: when he cannot repay, both borrower and lender are ruined. Fuel prices will decline to the level where they are supported by actual return on the use of the fuel rather than customer borrowing. Since only about 5% of fuel use is directly remunerative, that is the level of funding that will be available to the fuel industry. Fuel prices will be very low … but nobody will have any money. Those who do will not waste it driving aimlessly in circles. The global economy remains mired in stagnation or worsening. We have been able to offset the impact of higher extraction costs for all resources, particularly oil, with more debt, ZIRP and QE. That worked for many years. But we have reached the end of our rope. None of these offsets are spurring growth. And neither is lower priced commodities. The first graph is very interesting. What caught my attention is the dead cat bounce in Q4 2014, which took the CFIB back to its maximum (Q4 2010). What happened there? The dead cat bounce in oil prices was still months in the future and it doesn’t seem Alberta business owners put much faith into Christmas season shopping, if the rest of the graph is anything to go by. Was it just a classic case of optimism brought about by GDP growth forecasts? Or perhaps Alberta business owners, like their colleagues everywhere, expected consumers to spend every cent they saved on fuel on other purchases? Good article and accurate, imho. I know absolutely no one who actually believes any sort of rebound was in the cards or was in progress. As for BC, it used to be that forestry, mining, and fishing was almost 90% of our economy. When I was a kid, forestry was 2/3!! Recently, I heard a pundit say on the news that 70% of our economy is now service based, WTF? Plus, a lot of new money is from immigration from prarrie provinces and Ontario; folks who made their money and decided to retire in a better climate where your cojones don’t freeze every winter and where bugs don’t haul the rest away in the spring. Add in the Chinese flight and booming construction in Vancouver, Victoria, Kelowna, and Nanaimo…+ elsewhere, and you get a masked impression that all is well. Those established and retired, at least many of them, are doing very well. Young folks are struggling and working hard, much like I had to do in the ’80s. Canada, (except maybe Surrey, Winnipeg, and some smaller Sask cities), is mostly safe, blessed with natural resources and the all important ‘water’, is self sufficient + in energy and food, and has excellent health care and education sevices. I can think of no better place to face a world-wide economic downturn. It is never fun, (and I have had many tough years struggling with a young family in the past), nevertheless, our future prospects are better than most other places in the world. In my little rural valley we have had recent immigrants arrive from Europe, Australia, New Zealand, the US,and of course, Alberta. There is a reason for their choosing to move here. I totally agree — my wife and I emigrated to Canada from the United States 5 years ago, and apart from being forced to buy Canadian dollars at their peak and earn them at the trough, I haven’t a thing to complain about . . . It is natural that Canada would be affected strongly by a worldwide commodity downturn; at the same time, Canada is where I want my kids to grow up and the society I want them to be part of. I agree that this is a great time to short Canadian investments, I’m doing it myself (by holding on to cash, mostly) — but it’s important to remember that these naturally go up and down, and there are all kinds of longer-term factors that matter just as much. Frankly, Canada SHOULD be more than commodities, and maybe this is a good time for the government to work out some sustainable strategies in other sectors. And WTI is up today big time, all based on the rumour that OPEC producers are now talking about ‘exploring’ production stability, plus US production has just started to decline. “The lack of a radical critique is a problem for labour and the left. Goodwin knew his Marx, and he knew that fighting for “fairness” and “respect” was a mistake. First, he understood that if you start by asking for fairness and respect, by the time you negotiate and bargain and cooperate and compromise, you will end up settling for something less than fairness and respect. Second, if you call for fairness and respect, you open a debate over what those words mean. That is a debate workers are likely to lose, because they do not control the media where the debate will take place; they will be drowned out as the bosses define the terms. After all, as Marx observed, it was just as “fair” for capitalists to try to lengthen the working day as it was for workers to try to shorten it. “Between equal rights,” Marx pointed out, “force decides,” and so the work day is determined not by appeals to fairness and respect but through struggle. Goodwin understood that, and he understood that one of the weapons in that struggle was radical thought. Ironically, the BC Liberal government took Goodwin’s politics more seriously than some of his supporters; they tore down the signs proclaiming Ginger Goodwin Way because they understood that Goodwin and the memory of his radical politics are a threat to them. There is a masked intention under the guise of Globalized Trade to enrich a few at the expense of almost everyone else, and those at its forefront control their political minions and almost all forms of mainstream media. Those are the new ‘Bosses’. I believe Globalization is now collapsing under its own weight of tyrannical unfairness and sick economics. Hopefully, what replaces it will be better. Not only does Canadian manufacturing have to compete with Bangledeshi textiles, Asian industrials (including Chinese products on the Walmart conveyor), we also compete with Mexican maquiladoras and right to work southern states. In addition, the Scott Walkers of the world including fat boy Chris Christie continually bash unions and working people in search of their own rise to power and more and more people seem to believe them. In this race for the bottom only the rich and financial manipulators seem to thrive. It’s time to hold our breath and pull the bandaids off and get on with it. The longer change takes the more violent will be its arrival. I live in BC and would be happy to pay a little more for Canadian and US made products but can rarely find them. Practically everything I buy is made in China and it frustrates me no end. Nick — curious, what part of Canada did you move to? My wife is from GTA, and I’ve been trying to convince her to move back there from Austin, but it’s been an uphill battle that I have not won yet. However, in almost every aspect, our family would be better off in Canada than we are here in the States. Only thing that scares me is the current cost of housing, but I, like most others on Wolf’s site, believe the bubble will come crashing down soon. Though I realize that will dim the job prospects. I’m in InfoSec, so GTA is the most likely place for me to find work. Just can’t stomach the housing prices right now. It’s actually not easy to choose how to move to Canada — the place is a lot of little regional economies, and Canadians are, in my experience, less willing to hire people at a distance than in America. Local networks are stronger here. My wife and I landed in Victoria, but I couldn’t find a job there and we moved to Edmonton. Three years ago, when we came, the economy here was like nothing I’ve ever seen — high-paying blue collar work was so available that it actually took pressure off the white collar labour market. Office workers would get a certificate in something like pipeline placement and go up north. Now, I wouldn’t recommend it. Like you point out, the problem with the GTA is housing and sprawl. I went to college in Toronto, one of the main reasons I went back; but I knew in 2010 that my wife and I wouldn’t be paying cheap rent just off Bloor and Spadina — we’d be two hours out, and I’d be lucky to find work on my side of the city. No thanks. I’m also waiting for the bubble to break, but as everyone knows, the damn things are persistent. A lot of Canadians believe that they are going to have a soft landing, and they might be right, who knows? I don’t know anything about your field, but if you could find work in Ottawa, or Montreal, or London, or Halifax, I’d move in a second. GTA is tough, it depends what you want. In my field, AB or SK were the best bets, or one of the three territories. Personally speaking, raising a family in Canada is light years better than the States. Thanks for the response. My particular line of work is Information Security, aka Cybersecurity, so most of the jobs I’ve seen listed are in and around the GTA when I’ve looked. I won’t even consider BC because housing there is even worse than the GTA. I wouldn’t mind Calgary, but with huge hit to commodities being what it is, and energy companies are pretty far behind the ball on their information security programs, the job listings I see posted out there are few and far between. Much as I hate the idea of the cost of housing in the GTA, I do firmly believe it’s all going to come crashing down at some point soon. I don’t think there’s a soft landing in store for housing in Canada at all. Then again, I’ve been saying that for the last three years and it just keeps going up and up and up. How it hasn’t burst at this point is beyond me. But my wife has a huge extended family in the GTA, most of them split between Mississauga and Oakville, so it’d be dumb for us to move anywhere else, really. Especially as we have no family around in Austin, where we currently live. I dream of the free babysitting and the multitude of date nights we could have! But really for us it comes down to family, and the quality of life. While I’m not necessarily a fan of the long, cold, winters, I’m also not a fan of 100*F+ long, hot, summers these days. I don’t know what we’ll do for sure one way or another, but I’m with you in that I think raising a family in Canada is a lot better prospect these days than raising one in the States. 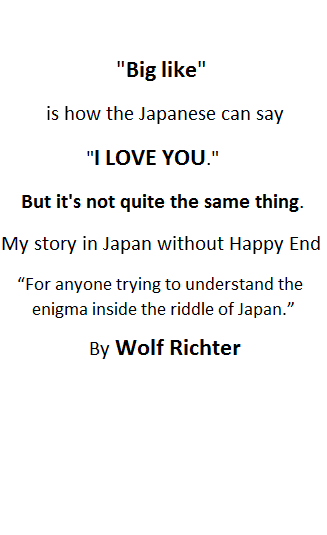 Thanks again for the response, I appreciate it. Yes, Canada is a life boat, which has developed a leak, and taking on water. Since the financial crisis, there was barely any growth despite the population piling up record residential and non-residential debt – and the resource boom. Now, that the growth has been basically pre-paid, the going gets tougher. Seeing that NAFTA has ruined the Auto Pact and that Mexico can take over Ontarios manufacturing, it seems the collapse of Western Oil is the only thing standing in the way of a 25 cent CDN Dollar! Evelyn, GTA is Greater Toronto Area, which includes the amalgamated city of Toronto, Scarborough, Mississauga, etc. It’s supposedly the 4th largest metropolitan area in N. America now. Here in the Palm Springs area, a large chunk of home buyers the last 4-5 years have been Canadians from Alberta. They were key in driving the market up here. It’s always the second homes that are the first to go when times get tough. The first ones out will realize a nice profit not only from price appreciation, but FX exchange as well. The stragglers, not so much, as the RE market is already showing signs of rolling over in S. CA. I don’t know how much stock I put in anything the CFIB puts out. I was once a member of them and cancelled my membership once I found out the President likes to do back room deals to get hey way. She’s just another lobbyist who does nothing for small business and has her own agenda which teeters on the side of the Ontario Liberal party. Anyways, until the next Oil boom Canada in 20-30 years when the price per barrel is back up to over 100 dollars again, but this time the price at the pump will be double what it was before. Called economic cycles. I am from Ottawa, in InfoSec and can’t seem to live in the same Canadian reality as you either do or imagine Canada offers these days. Myself and my wife are both univ. graduates, professionals, with high salaries (in the Cdn context), with 2 kids and with a combined AFTER TAX income of less than what my nephew in Houston, TX brings home. No, he’s not a doctor, or a dentist, just a smart techie. Caveat emptor: do your math before considering joining one of the most indebted nations (government, corporate and personal levels). Yes, kids do not have access to guns as they do in the US, however to this day 1/2 of my engineering university class still lives happily in the US (with no plans of returning). These are facts in my community. Victoria, BC since its only a gov/retirement city is a lot more appealing (weather not included in the assessment). GTA on the other hand…. just been there last weekend and seemed much more congested in the weekend than Houston at rush hour. But maybe I got unlucky. Let’s just say I am surrounded by quite a few families with gross incomes of $200k+/yr who live month to month. Living in 1800 sq.ft homes and driving slightly used Honda Civics and CRVs. Philosophically speaking, one could say that “the best things in life are free”. So yes, if your family is in Canada, then it may make sense to pay the additional price and move up north. Thanks for some hard numbers, the more perspectives one can get the better. Curious though — if you’re so unhappy with the financial side of life in Ottawa and Canada in general, why haven’t you and your wife moved to the US? It’d be very easy for someone like you to immigrate here, especially with how in-demand our field is these days. And what in the heck does your nephew do in tech in Houston? I live just a few hours up the road in Austin, and if his single income is greater than your combined after-tax income… well, either y’all are doing something wrong, or he’s one of the very lucky few who hasn’t been affected by the downturn in oil yet. I keep tabs on the market in Houston, as my folks live in the Woodlands, just north of Houston, and I do not recall tech jobs paying any better in Houston than they do in Austin. In fact, typically it’s the opposite — way more tech jobs are available here in Austin and they tend to pay better than what’s available in Houston.